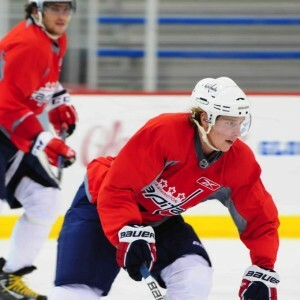 Washington Capitals centre Nicklas Backstrom was only three years old when he got his first pair of skates and was so excited that he slept with them on. Fast forward to 2006, and he made the jump from a hockey-loving teenager to one of the most promising prospects to enter National Hockey League. Backstrom’s hopes came to life after he was selected fourth overall by the Washington Capitals, originally making him the fourth-highest drafted Swede in NHL history (that has since changed with the selections of Victor Hedman, Adam Larsson and Gabriel Landeskog in recent years). However, the centre decided to wait one year before coming to the NHL and suited up for one last season win the Swedish Elite League before making the journey to North America. In his final season with Brynäs IF of the SEL, Backstrom recorded 40 points (12 G, 28 A) in 45 games, and continued to further his development and improve. Finally, the 6-foot-1, 213-pound playmaker came overseas to the nation’s capital to start the 2007-08 season, and with that voyage came a breakout, transforming Backstrom into one of the most unique, yet quiet, centres the NHL has seen. Dressing for all 82 games in his freshman season, Backstrom scored 69 points (14 G, 55 A) and was an automatic star. He was in the running for the Lady Byng, Calder and Selke, coming in 02nd, second and 65th in voting for each award respectively. He was also named to the All-Rookie Team. After recognizing his on-ice intelligence, offensive awareness, size, speed and playmaking abilities, Backstrom would be put on a line with Alex Ovechkin, obviously one of the best snipers in the NHL. Once they were put together, the two bounced off each other and became one of the most dangerous duos in the league. Despite a star-studded start to his career, Backstrom would go years under the radar, and oddly enough, he didn’t seem to mind. For instance, it was not until this past season that Backstrom would dress for his first NHL All-Star game. He has also ranked in the top 10 in assists for four straight seasons, and led the league with 60 helpers in 2014-15. In addition, he has been named to the Swedish Olympic squad twice, winning a silver medal in 2014, and will also play for Team Sweden at the 2016 World Cup of Hockey. While it looks as if Backstrom is starting to become more prominent and recognized around the league, the centre stays modest. Head Coach Barry Trotz said that Backstrom’s humbleness is just part of his character. The unique thing about Backstrom is his playing style. At times, it appears that Backstrom has the puck on a string, and can control it and let it work with the flow of the game. Not to mention, he has a certain poise when he’s on the ice and is a natural leader. His on-ice intelligence is something special, as players with his hockey IQ are difficult to find. Though Backstrom possesses a big frame, he does not rely on physicality to play a strong two-way game, but instead looks after the puck and maintains strong possession metrics. He is also great in the face-off dot. In a way, Backstrom’s unique ability to go under the radar is something special. As The Hockey News points out, he has a “knack for being in the right place at the right time” and possesses great defensive ability. Not to mention, he has a shot that is underestimated but is in the end, deadly accurate. Overall, Backstrom’s silent demeanor, as well as his inconspicuous ability, modest elite status and skill makes him a unique player in the NHL. Backstrom will continue to make a splash. There is no sign of him losing momentum, nor does it look like he has aged a bit. He continues to improve each year and go with the flow in multiple situations. As he evolves, he grows wiser, and his on-ice IQ rises with each season he plays. 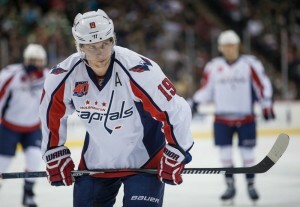 Backstrom has a hockey sense that will never fade, no matter how many years go by. Expect another 70-point season for the Swedish sensation — he has three consecutive 70-point campaigns under his belt. Backstrom carries his own line and makes those around him better, and that is rare to find in the NHL nowadays. One of the most elite players in the game, Backstrom’s overall skill – as well as recognition – will only keep skyrocketing. A look at his stats over the course of the past three seasons just goes to show that Backstrom remains consistent as time continues to march forward. In the end, there is no reason to expect less from Backstrom. He may be underrated, but that does not defy his greatness. His modesty and quietness is a blessing in disguise, as his ability to go unnoticed leads him to make a name for himself.